Residents of Mae Ra Ma Luang refugee camp in northern Thailand are bracing themselves against further flooding that has already swamped 400 houses, made 2,000 people homeless, destroyed 2,000 sacks of rice and hundreds of bags of other essential foodstuffs. Heavy monsoon rains lashed the north of Thailand last week and earlier this week breaking the banks of the Mae Sariang River in Mae Hong Song province and flooding the refugee camp and village. Camp officials say no one was killed or injured in the camp but three people are reported dead and 5 missing on the road between Mae Sam Laap and Mae La Oon refugee camp. Saw Kaw Mu, secretary of the Karen Refugee Committee Education Entity at the camp, in an exclusive interview with Karen News said. Saw Kaw Mu said children are getting sick from playing in the floodwaters. A member of the humanitarian team working to deliver aid to the refugees told Karen News that the floodwaters have subsided for the moment. Mr Wibun Sanguanphong, a senior official from Thailand’s Disaster Prevention and Mitigation Department said the storms were a result of tropical storm Nock-Ten that hammered Vietnam’s coast late last month. Mr Wibun told reporters that heavy rains caused damage in 21 provinces, resulting in flooding so heavy that the provinces were declared disaster zones. It has been reported that at least 20 people were killed, over a million people affected and 6,197,723 rai of farmland flooded. Refugees are worried that the if the rains do not ease they fear a repeat of the floods that devastated the area in 2002, killing at least 14 people after a mudslide and floodwaters hit a refugee camp on the Thai-Burma border. Witnesses at the time said Ban Sala camp in Mae Hong Son province, lost more than 300 buildings that were swept away and destroyed in the floods. 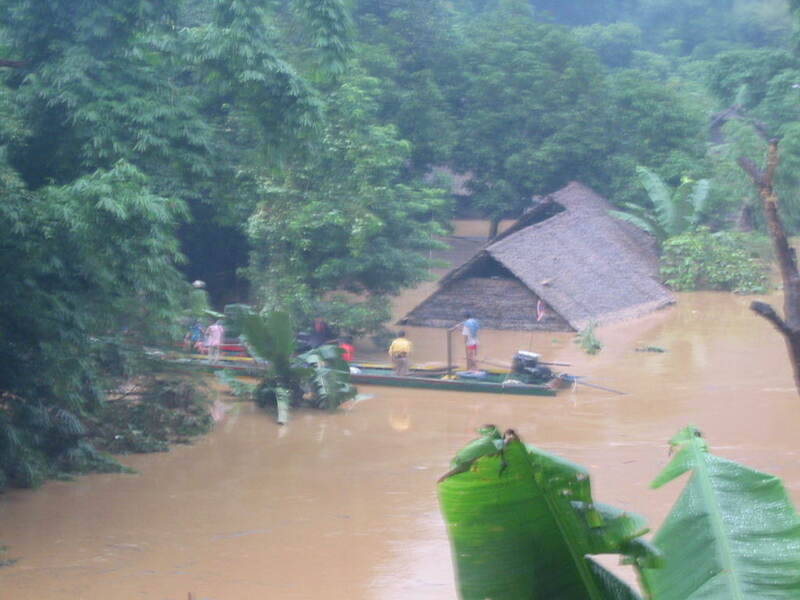 Mae Ra Ma Luang refugee camp is vulnerable to floods as it is located in the river valley. Storm waters have already washed away meters of the riverbank near the refugee camp.